Whenever I listen to an album for the first time I have found that I must be wary; oftentimes some of the best albums are unappealing until subsequent listens, and some of the most mediocre sound fantastic to fresh ears but grow stale as time goes by. However, sometimes an album is incredible on first listen, and while it loses some appeal as it ingrains itself into your memory, it still remains after many repetitions an excellent and admirable piece of music. 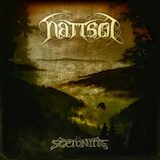 I will go out on a limb and say that Nàttsòl, a new Norwegian Black Metal band comprised of members of many underground groups (including my Black/Viking Metal darling Voluspaa), has created a truly fantastic debut in Stemning, even after the shock of its fresh take on the sub-genre wears off. Stemning (Norwegian for “mood” or “atmosphere” according to the promo information) is a short, six-track album, whose sound can best be compared to that of Metal-era Ulver (also claimed in their promo information), though that is being quite unfair to Nàttsòl who have forged quite a unique style of their own. Melodic and yet strangely dissonant and disturbing Black Metal riffs form the bulk of Nàttsòl's sound, brought to life with a crisp and clear production, but not so clean as to remove character from the rough guitar tone. The bass is almost always audible and the drums are not so loud that they drown out the guitars or vocals. While it is not the most traditional Black Metal production, it works amazingly well for Nàttsòl's unique style. Stemning starts off innocuous enough with the opening strains of Ved Aas I Haustmoerket sounding like a typical modern Folk/Black Metal song, but soon enough the band draws you in and beckons you to listen to the intricacies and complexities that course through the fabric of their music. Haunting, epic clean vocals mixed with a variety of growls, rasps, and shrieks, gyrating drums full of menacing fills, and twisting guitar riffs that unexpectedly crash and split and rejoin, making a mockery of pleasant melodies: these are all elements of what you soon realize is an absolutely amazing composition. To an untrained ear or a listener failing to pay attention it will sound like a typical Folky Melodic Black Metal album, but one entrenched in the music will hear something far more interesting. There is so much I could wax lyrical about, so many brilliant moments and intricate harmonies and dissonant melodies, however I think it best I don't spoil too much, as it really is a wondrous thing to behold on first listen. However, I can still outline how Stemning plays out, as well as its strengths and weaknesses. Ved Aas I Haustmoerket and Ved Baal I Kveldstime are both complex beasts with quite a lot of folk elements, such as acoustic breaks and clean vocals, as well as the latter having some acoustic guitar cleverly mixed into the furious Black Metal sections. These first two songs are my favorites from Stemning; They highlight everything the band is capable of in terms of atmosphere and composition. I'm often at a loss as to what to focus my attention on at any particular moment because of how excellent each instrument's parts are and how they synchronize and de-synchronize so fluidly, working together at one moment and conflicting at the next. These songs showcase Black Metal on the precipice between chaos and order, melody and dissonance. They will take you to the brink and pull you back into safe territory, only to terrify and chill you seconds later. It makes for a wonderfully unsettling and uneasy listen. The middle two songs, Ved Skog I Natterstid and Ved Fjell I Vinterblaest, are both played in the same style as found on the first two but are more straightforward, simple and hypnotic Black Metal. They both lack the glorious clean vocals heard earlier, but are competent enough. While they are certainly my least favorite tracks, they are by no means bad, they just have a different feel from the rest of the album. They could, however, stand to repeat riffs a little less often as they aren't as good at stripped down Black Metal as most other bands who specialize in it. Ved Elv I Eismal Stund returns to the complex and folkloric-edged style of the first two songs, and serves as an excellent segue between the harsh, simple Black Metal of the middle and the following, entirely acoustic folk song Ved Hav I Avdagsleitet (featuring a vocalist from Voluspaa. Plug). I could go on and on about every little thing I love about this album, but it'd be better for me to tell you to just go and listen for yourself. Even if you don't pay much attention, I have found it is still enjoyable on its surface merits alone. Nàttsòl has certainly garnered my attention, and I look forward to what the creators of now one of my favorite albums of 2010 have in store for us in the future.